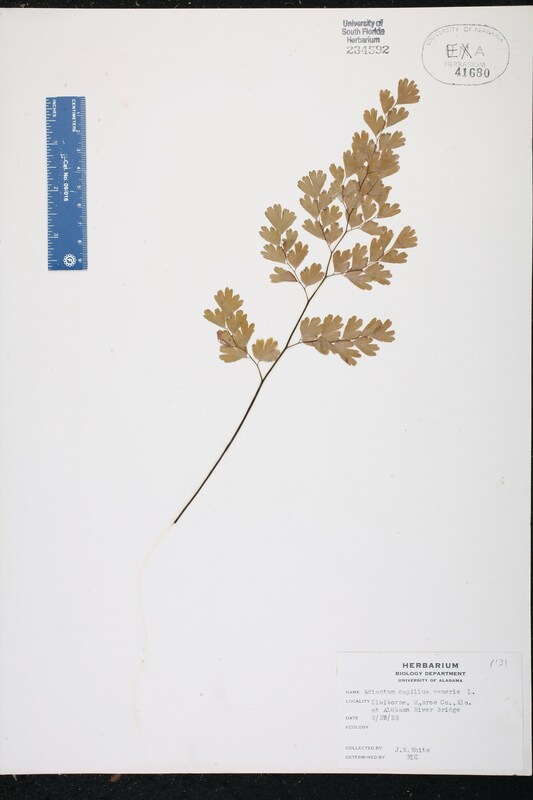 Citation ADIANTUM CAPILLUS-VENERIS Linnaeus, Sp. Pl. 1096. 1753. Type: FRANCE: Without data, Magnol s.n. (lectotype: LINN 1252.9). Lectotypified by Pichi-Sermolli, Webbia 12: 678. 1957. 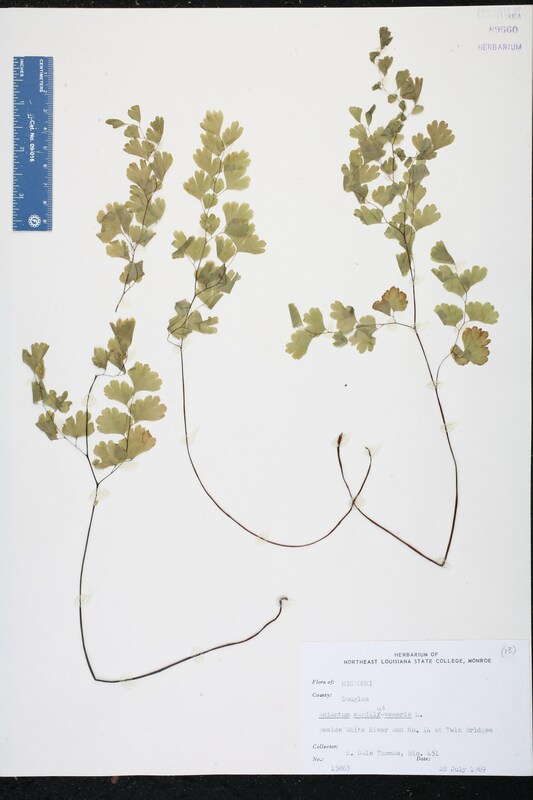 Adiantum australe Adiantum australe Riddell, New Orleans Med. Surg. J. 9: 616. 1853. 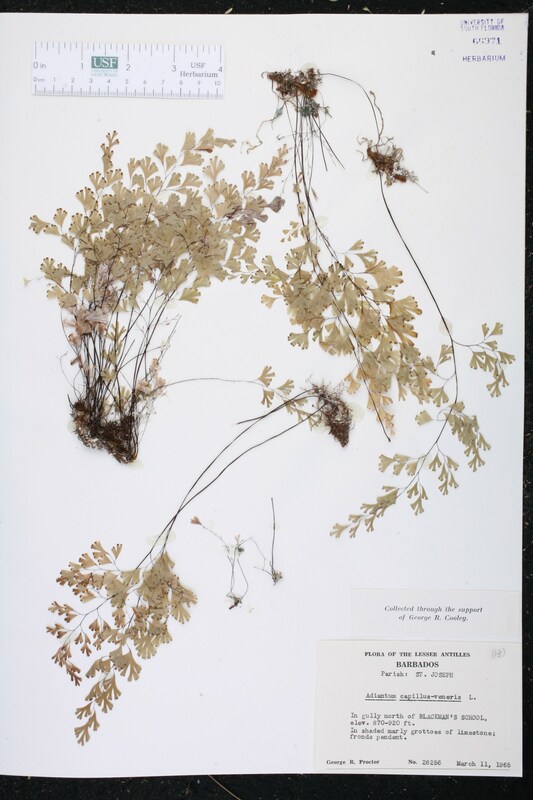 Adiantum capillare Adiantum capillare Saint-Lager, Ann. Soc. Bot. Lyon 7: 69. 1880, nom. illegit. 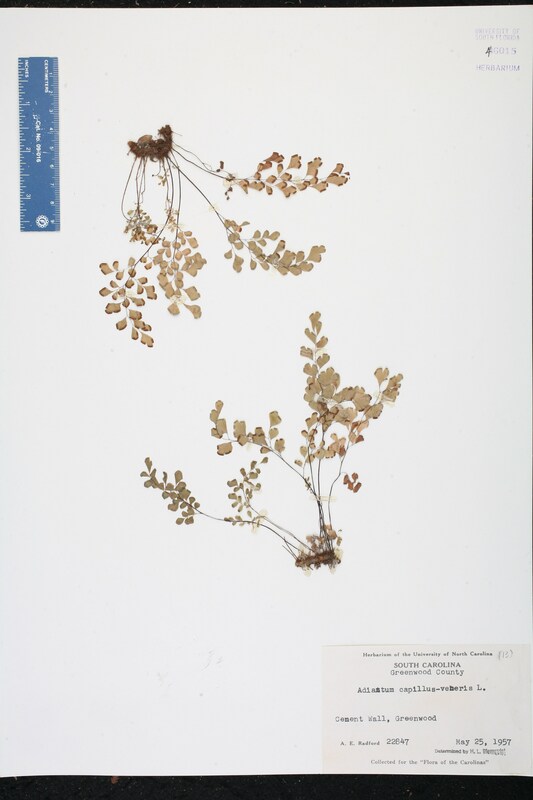 BASIONYM: Adiantum capillus-veneris Linnaeus 1753. 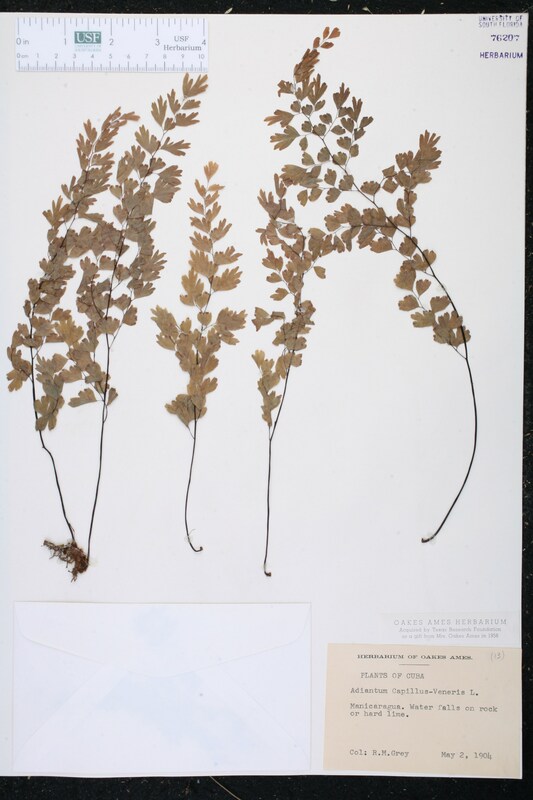 Adiantum capillus Adiantum capillus Swartz, J. Bot. (Schrader) 1800(2): 83. 1801, nom. illegit. 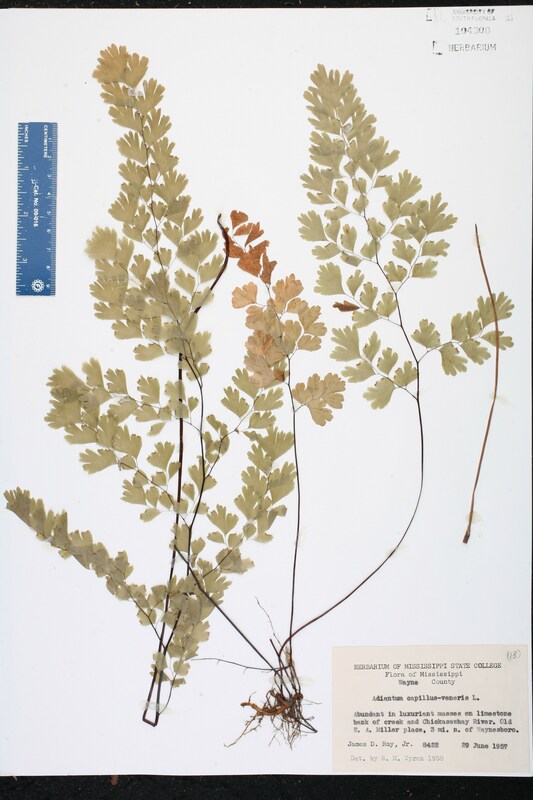 BASIONYM: Adiantum capillus-veneris Linnaeus 1753. 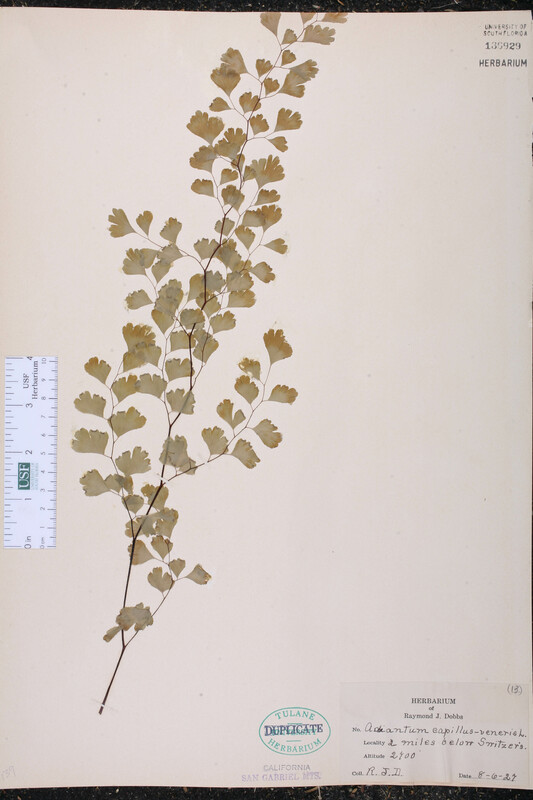 Adiantum capillus-veneris var. 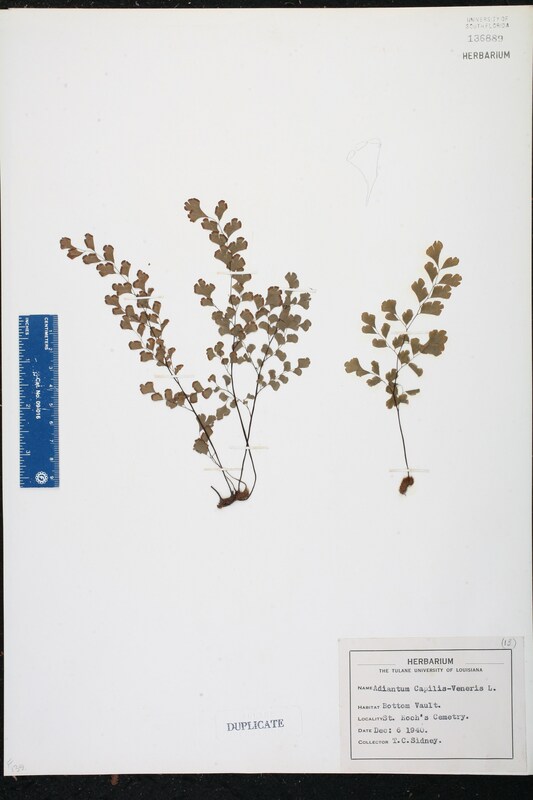 protrusum Adiantum capillus-veneris Linnaeus, var. 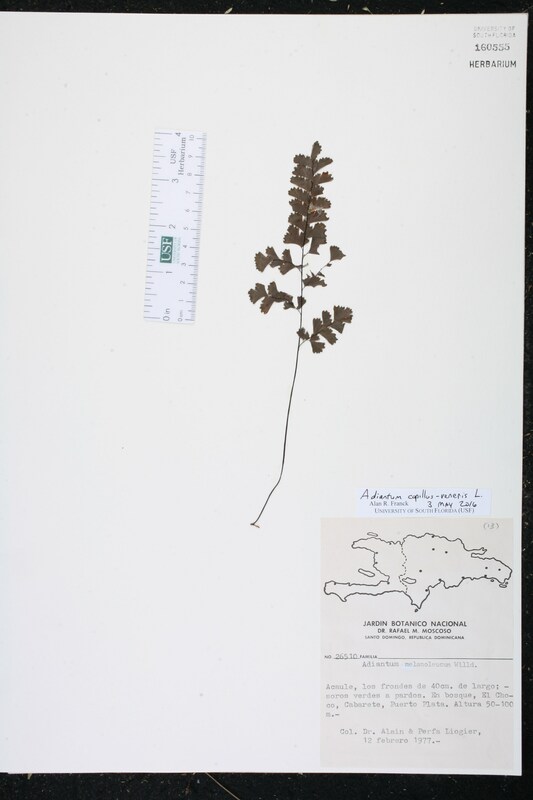 protrusum Fernald, Rhodora 52: 203. 1950. TYPE: GEORGIA: Clay Co.: Samochechobee Creek, 29 Oct 1902, Harper 1791 (holotype: GH). 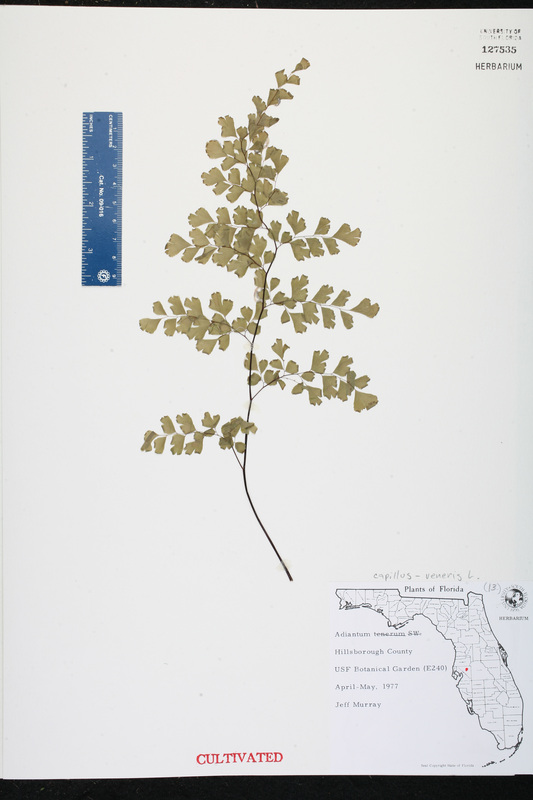 Adiantum coriandrifolium Adiantum coriandrifolium Lamarck, Fl. Franc. 1: 29. 1779 ("1778"), nom. illegit. 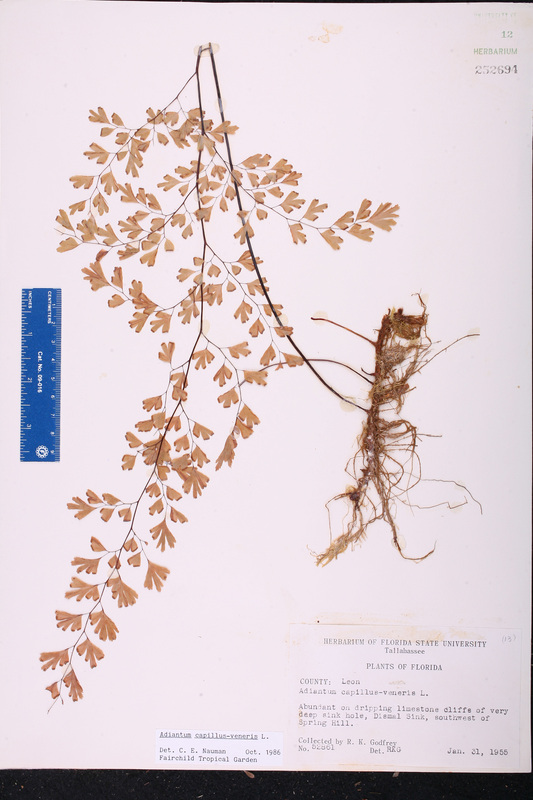 BASIONYM: Adiantum capillus-veneris Linnaeus 1753. 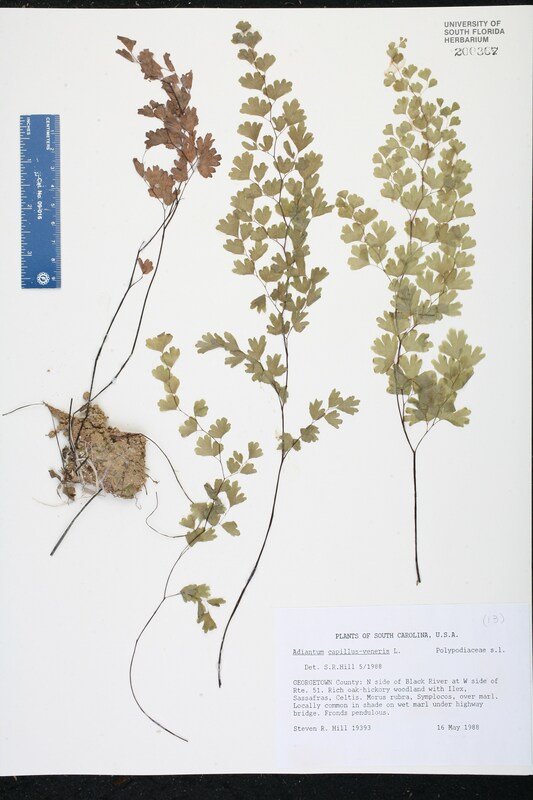 Adiantum fontanum Adiantum fontanum Salisbury, Prodr. Stirp. Chap. Allerton 404. 1796, nom. illegit. 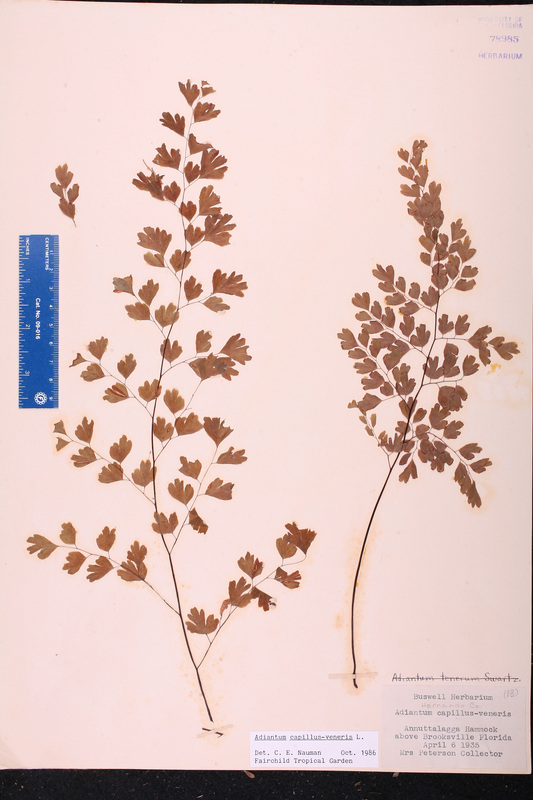 BASIONYM: Adiantum capillus-veneris Linnaeus 1753. 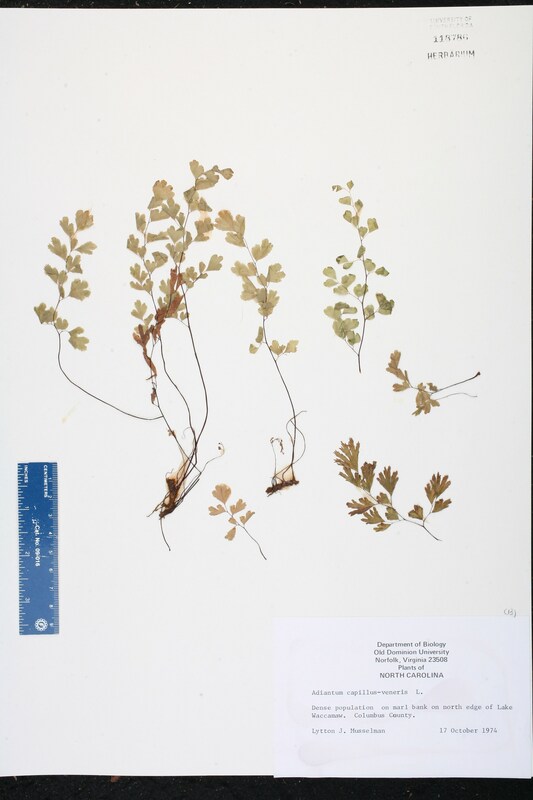 Adiantum capillus-veneris forma dissectum Adiantum capillus-veneris Linnaeus, forma dissectum (M. Martens & Galeotti) Ching, Acta Phytotax. Sin. 6: 344. 1957. 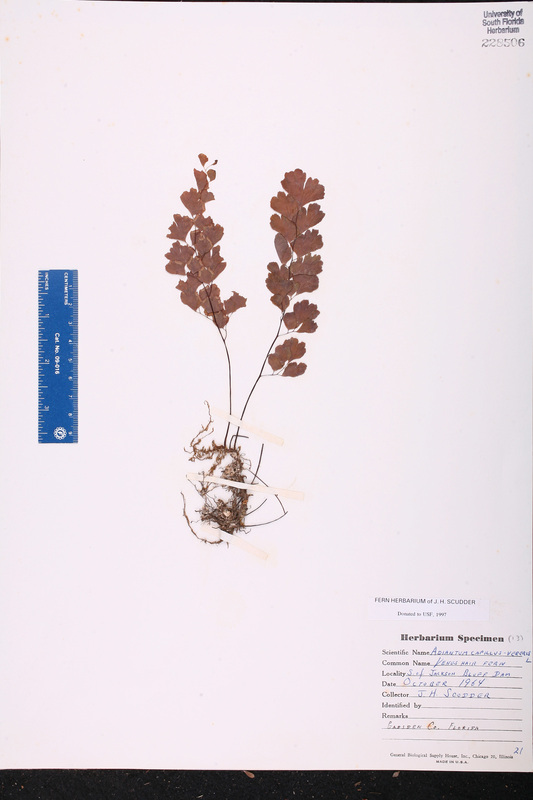 BASIONYM: Adiantum tenerum Swartz, var. dissectum M. Martens & Galeotti 1842. 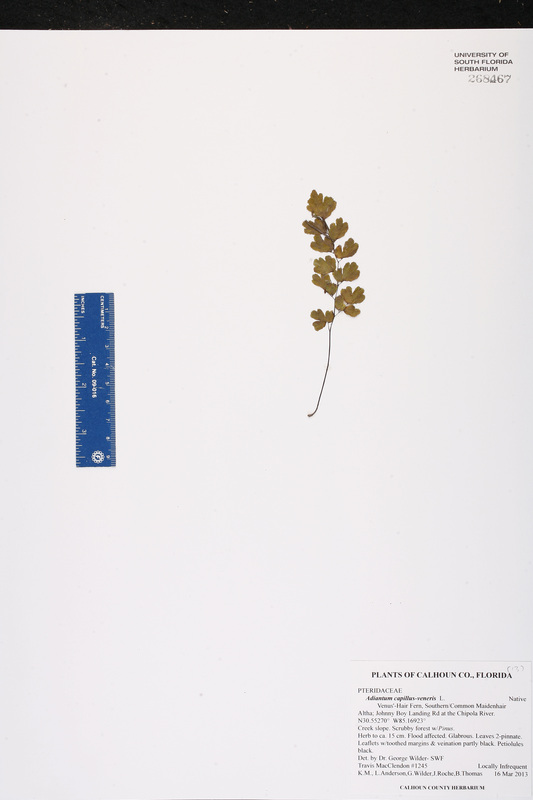 Adiantum capillus-veneris forma fissum Adiantum capillus-veneris Linnaeus, forma fissum (H. Christ) Ching, Acta Phytotax. Sin. 6: 343. 1957. 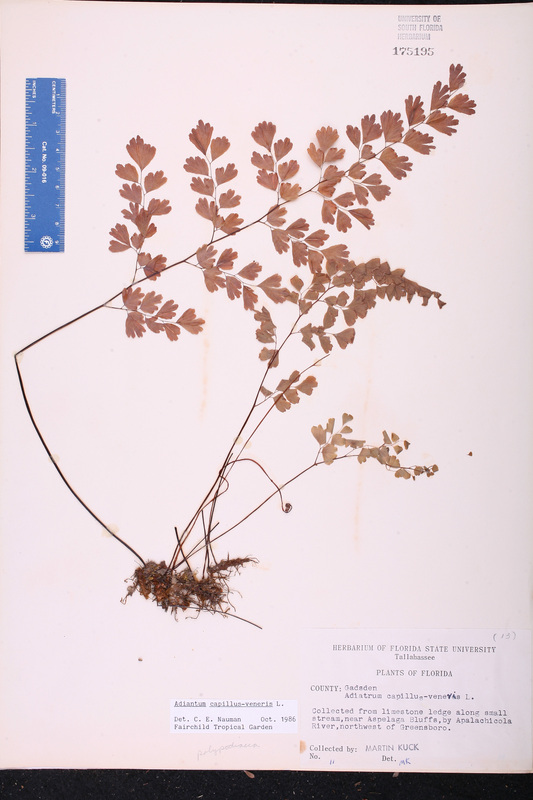 BASIONYM: Adiantum capillus-veneris Linnaeus, var. fissum H. Christ 1900. 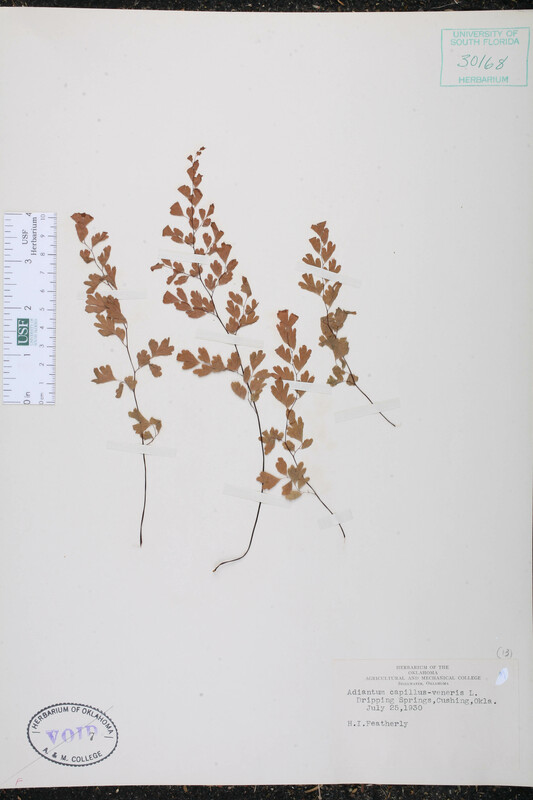 Adiantum capillus-veneris forma rimicola Adiantum capillus-veneris Linnaeus, forma rimicola (Slosson) Fernald, Rhodora 52: 208. 1950. 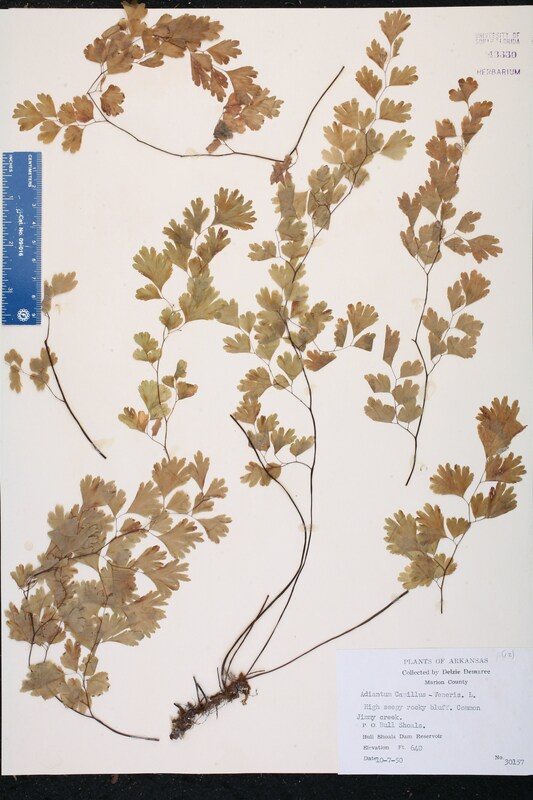 BASIONYM: Adiantum rimicola Slosson 1914. 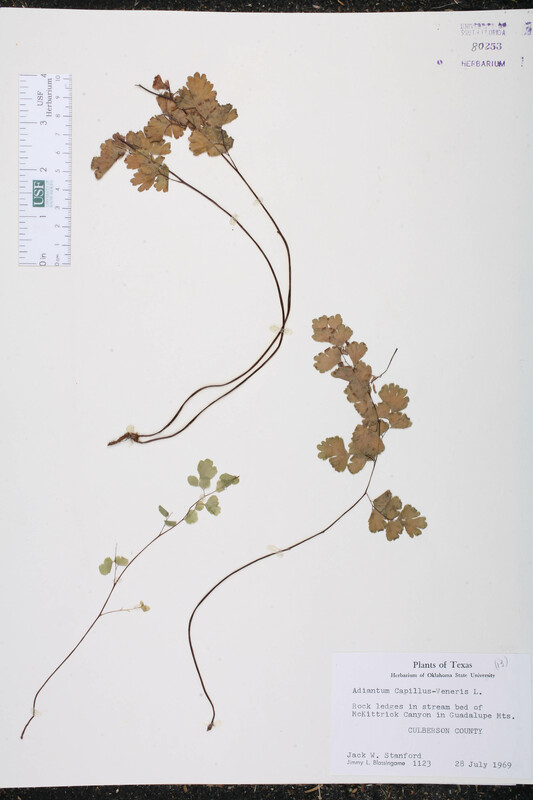 Adiantum capillus-veneris var. 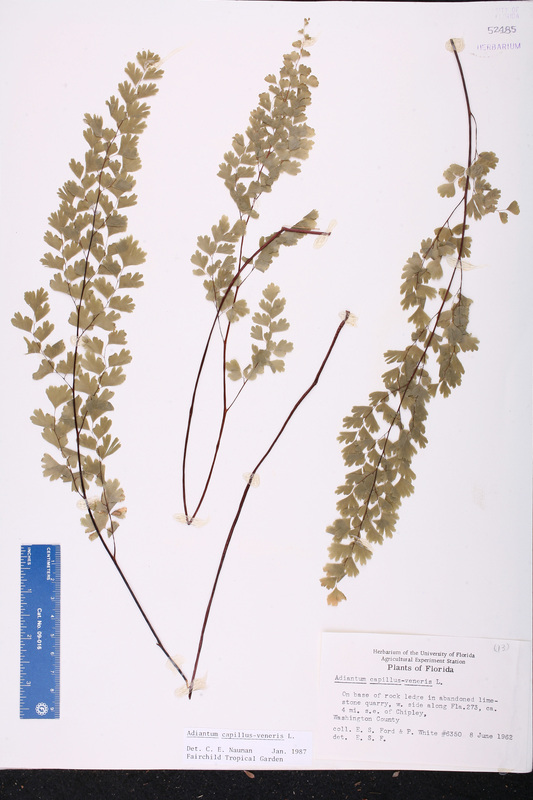 fissum Adiantum capillus-veneris Linnaeus, var. fissum H. Christ, Monsunia 1: 66. 1900. 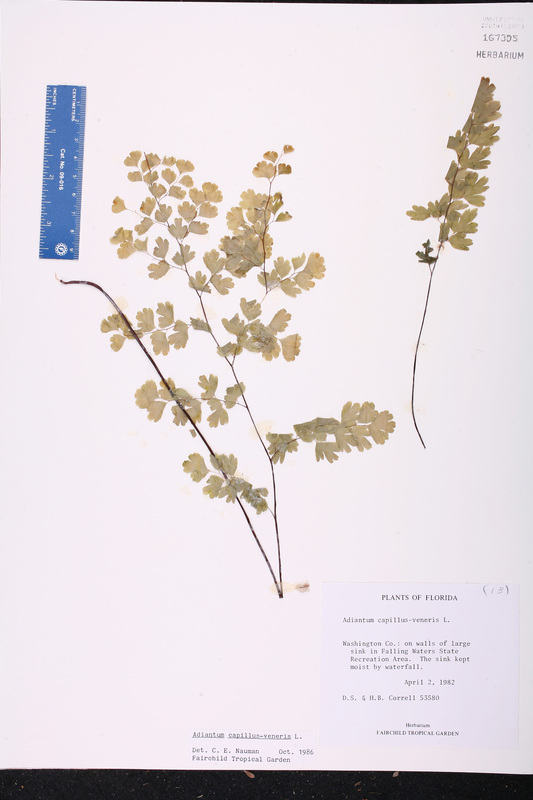 Adiantum capillus-veneris var. 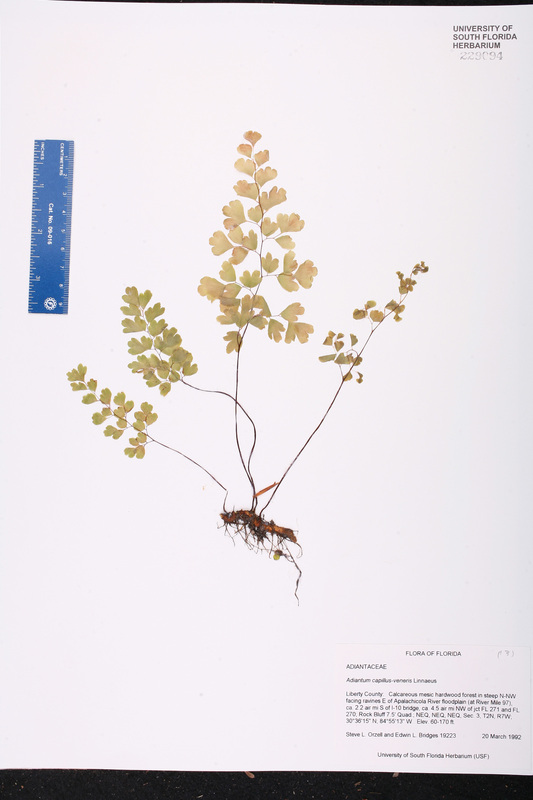 laciniatum Adiantum capillus-veneris Linnaeus, var. 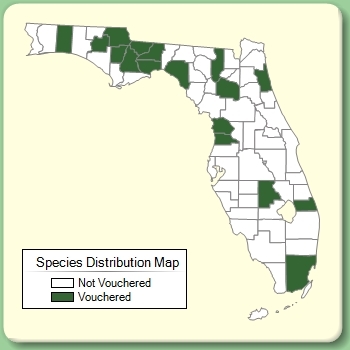 laciniatum H. Christ ex Tardieu & C. Christensen, in Lecomte, Fl. Indo-Chine 7(2): 185. 1940. 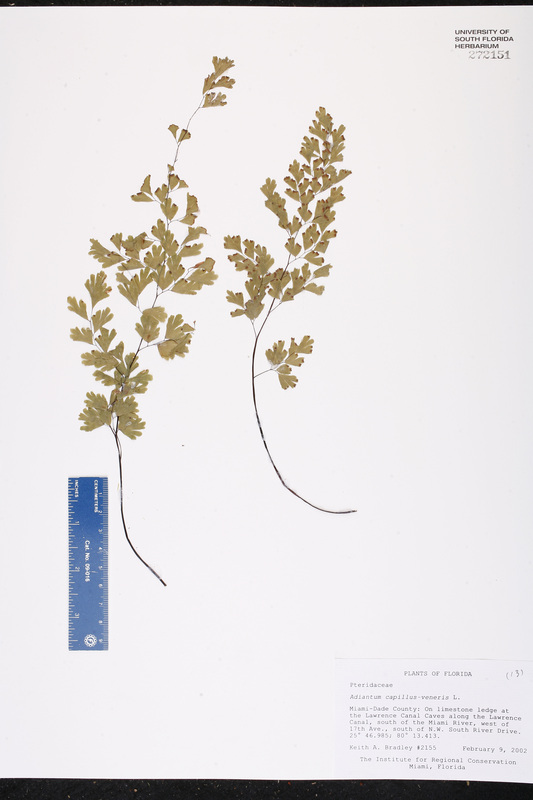 Adiantum capillus-veneris var. 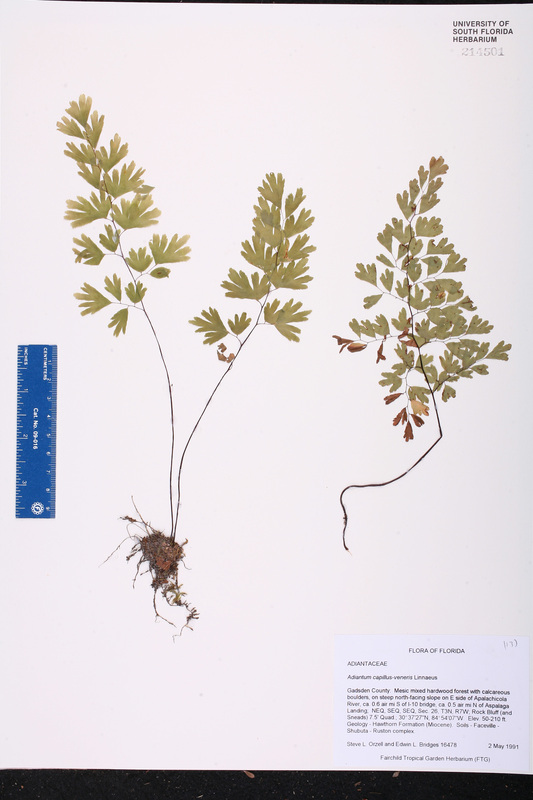 modestum Adiantum capillus-veneris Linnaeus, var. modestum (Underwood) Fernald, Rhodora 52: 206. 1950. 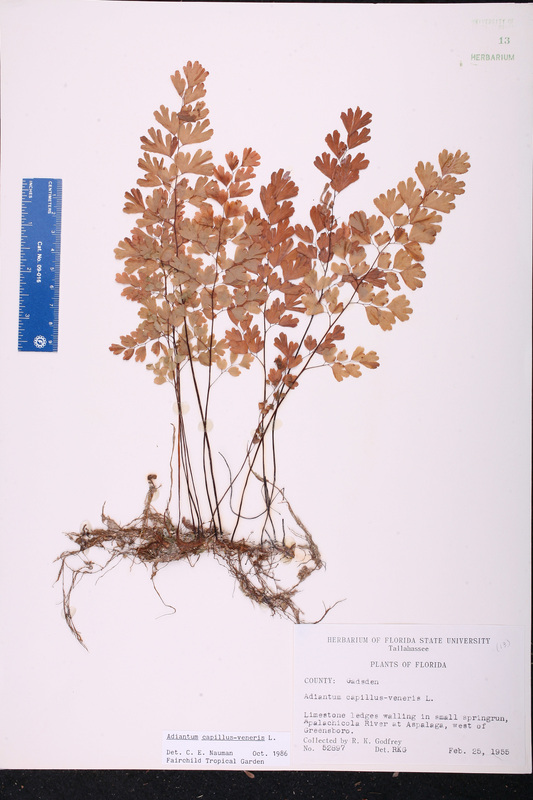 BASIONYM: Adiantum modestum Underwood 1901. 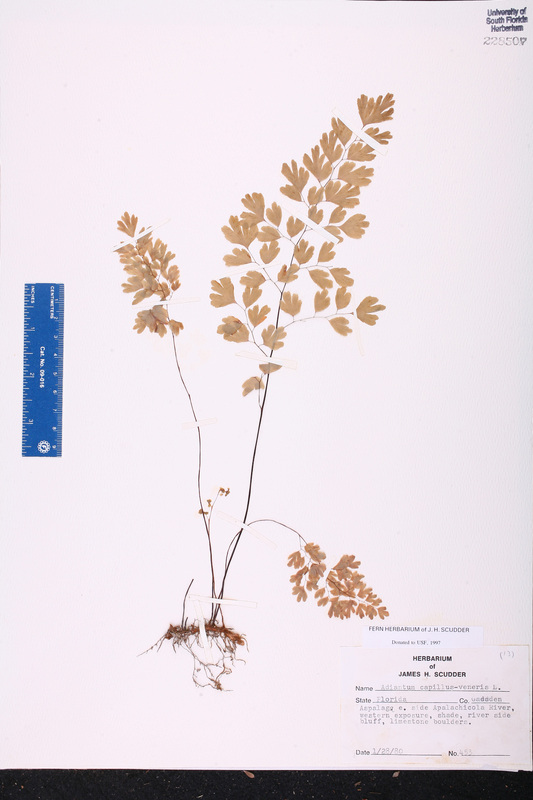 Adiantum capillus-veneris var. 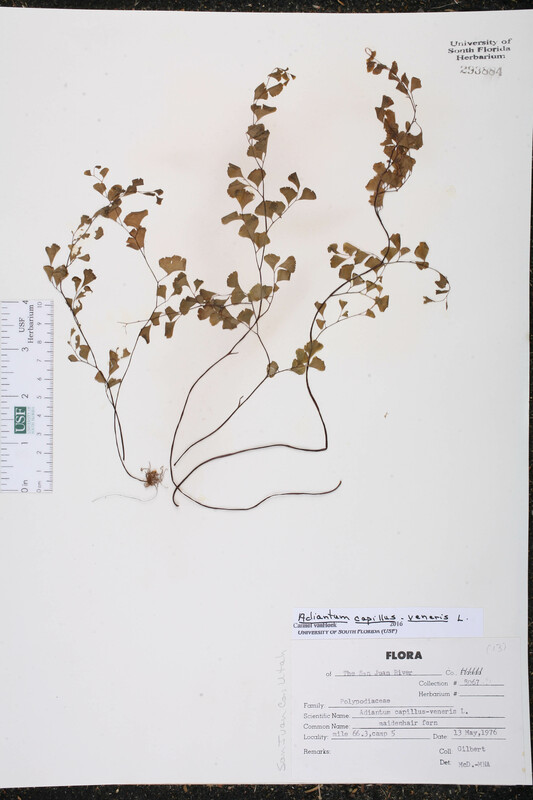 trifidum Adiantum capillus-veneris Linnaeus, var. trifidum H. Christ, Bull. Acad. Int. Geogr. Bot. 11: 224. 1902. Adiantum modestum Adiantum modestum Underwood, Bull. Torrey Bot. Club 28: 46. 1901. TYPE: NEW MEXICO: Chaves Co.: Roswell, North Spring River, 3 Aug 1900, Earle 261 (holotype: GH; isotype: GH). 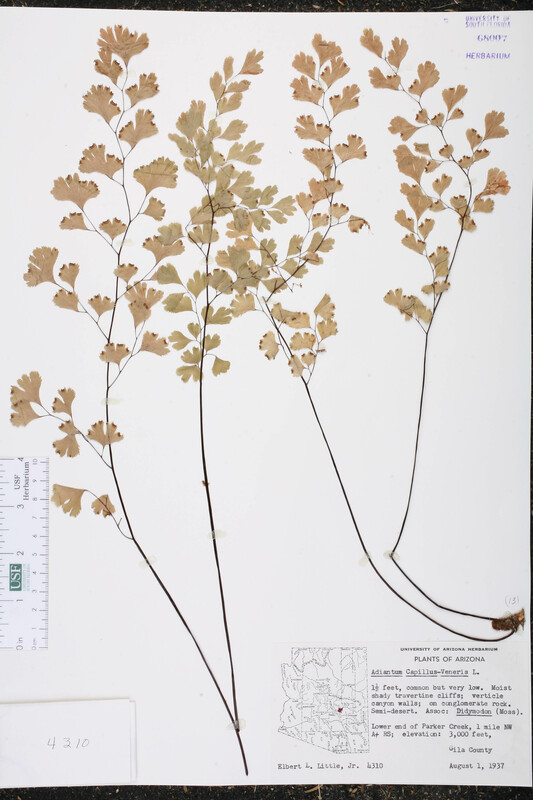 Adiantum rimicola Adiantum rimicola Slosson, Bull. Torrey Bot. Club 41: 308, t. 7(1). 1914. TYPE: UTAH: Armstrong Canyon, 4-6 Aug 1911, Rydberg & Garrett 9423(holotype: NY). 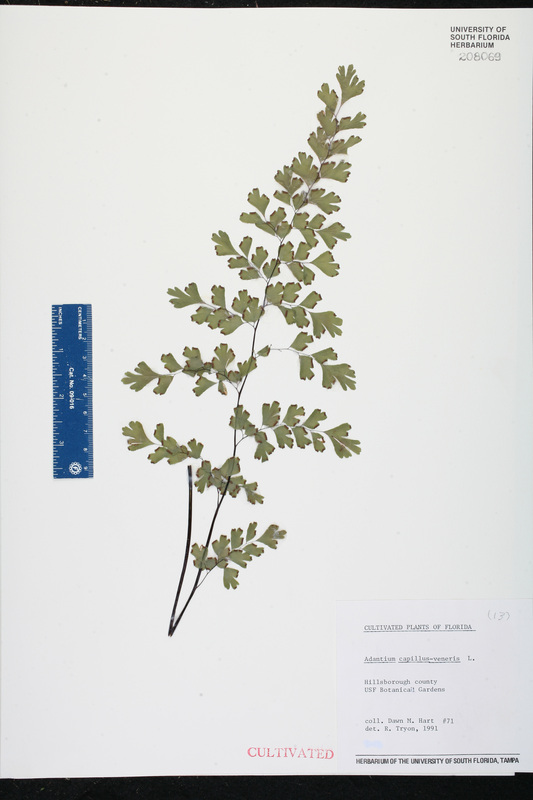 Adiantum schaffneri Adiantum schaffneri E. Fournier, Bull. Soc. Bot. France 27: 328. 1880. 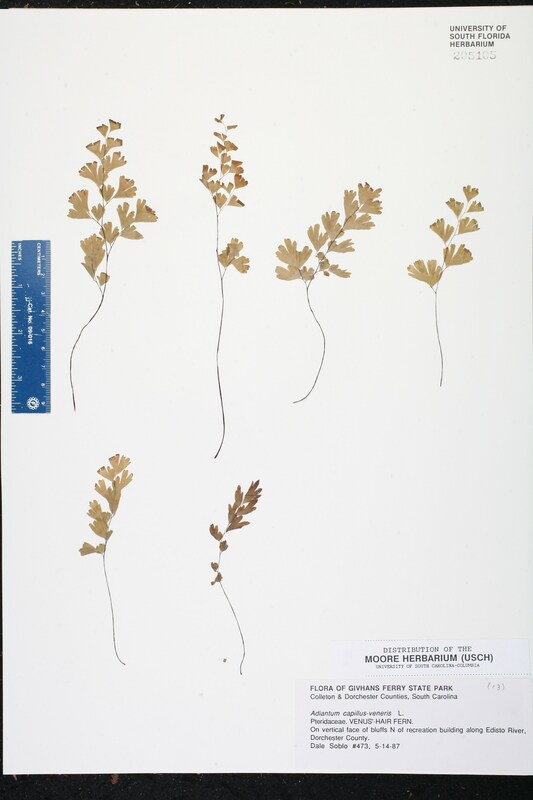 TYPE: MEXICO: San Luis Potosí: Near San Luis Potosí, s.d., Schaffner 64 (holotype: P; isotype: NY fragm). 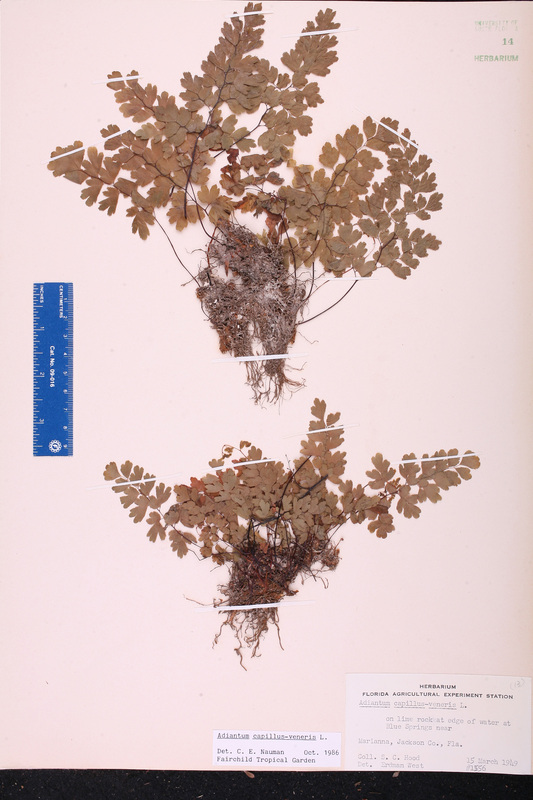 Adiantum tenerum var. 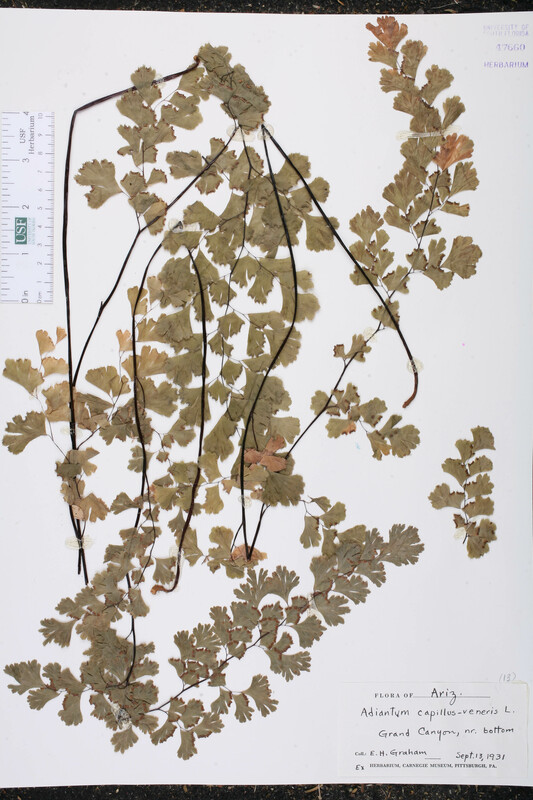 dissectum Adiantum tenerum Swartz, var. dissectum M. Martens & Galeotti, Mém. Foug. Mexique 71. 1842. TYPE: MEXICO: Veracruz [Oaxaca? ]: Without data, Galeotti 6361 (holotype: BR). USA Florida Hernando Co. 06 Apr 1935 Mrs. Peterson s.n. USA Florida Gadsden Co. s.d. M. Kuck s.n. USA Florida Hillsborough Co. s.d. D. M. Hart 71 CULTIVATED. USA Florida Hillsborough Co. Apr-May 1977 J. Murray s.n. CULTIVATED. Cuba Villa Clara Prov. 02 May 1904 R. M. Grey s.n. USA Arizona Coconino Co. 13 Sep 1931 E. H. Graham s.n. USA Oklahoma Payne Co. 25 Jul 1930 H. I. Featherly s.n. USA California Los Angeles Co. 06 Aug 1927 R. J. Dobbs s.n.